1.) Heat 1 tablespoon of extra virgin olive oil in a sauté pan, on medium high heat. Add 1 small, diced onion to the pan and sauté until browning begins. 2.) Add a pinch of salt to the onions and stir. Add 4 cloves minced garlic to the pan and stir for 30 seconds until the garlic becomes fragrant. 3.) Add 1 tablespoon dried oregano, and 1 teaspoon dried Italian seasoning to the garlic and onions and stir for 30 seconds. 4.) Add 12 capari tomatoes, 1 (15oz) can fire roasted tomatoes, and 1 teaspoon worcestershire sauce to the pan and simmer on low until thickened. Stir occasionally to prevent burning. Notes: Prepare the Chebe pizza crust according to the directions on the box. Crust works best if all ingredients are room temperature before combining. I use a stand mixer to combine the ingredients and then hand knead until soft and pliable. 1.) 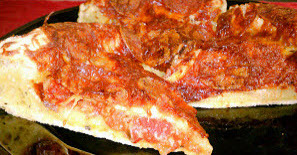 In a stand mixer add Chebe pizza crust mix with 2 tablespoons oil, 1 cup extra sharp shredded cheese, and 2 large eggs. Mix on low slowly adding ¼ cup of milk. 2.) Once the ingredients are combined, remove the dough to a piece of wax paper, and knead the dough until smooth. Form the dough into a ball. 3.) Place the dough ball into the center of a 9-inch spring form, baking pan. Press the dough ball from the center out. This will push the dough to the sides of the pan and create a 1-inch bump along the perimeter. Note: In order to obtain maximum crispiness without grease, it’s important to pre-cook the pepperoni. 1.) Place individual pepperoni slices onto a collection of paper towel and cover with an additional piece of paper towel. Microwave on high for 30 seconds. 1.) Preheat your oven to 450 degrees. 2.) Place ½ of your sauce into your dough well. Top with cheese. Top cheese with pepperoni. 3.) Place the pizza into your oven on the bottom rack and bake for 20 minutes. After 20 minutes, turn the oven off but leave the pizza in the oven for an additional 20 minutes.